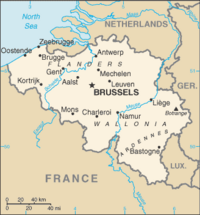 Belgium (Dutch: België; French: Belgique; German: Belgien) or the Kingdom of Belgium is a small country located in Western Europe, bordered by the Netherlands, the Federal Republic of Germany, Luxembourg, France, and the North Sea. Its capital city is Brussels. 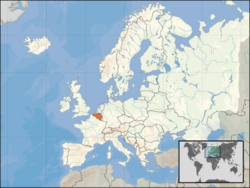 Belgium Conservapedia's article on Belgium. ↑ Prior to 1999, the national currency was the Belgian franc (fr.). This page was last modified on 2 September 2014, at 22:33.